Welcome to my festive Christmas dinner table! I’m so excited to share my dining room table that’s all set and ready for our Christmas Eve dinner. 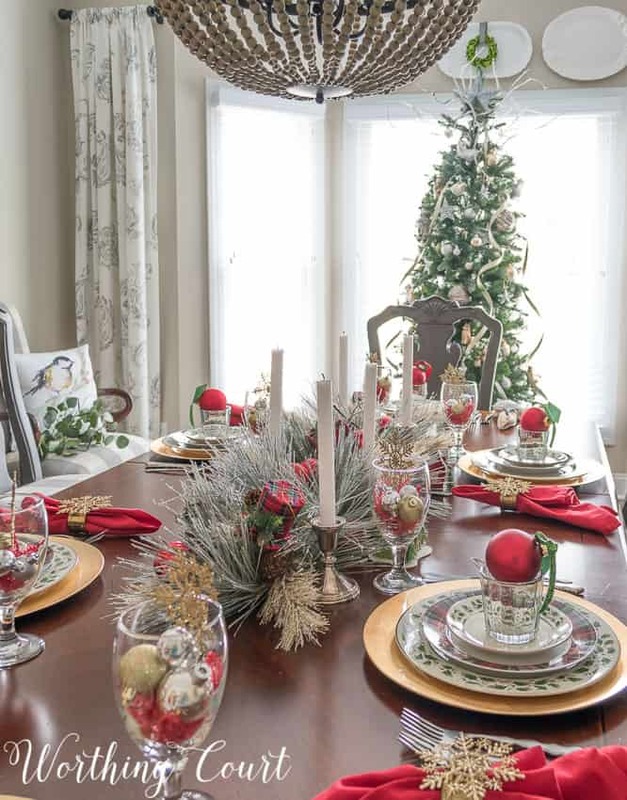 I wanted my table to reflect the special occasion, so I made sure to use the holly leaf Christmas china that Pookie bought for me when we were first married. The only problem is that it’s a bit on the formal side and I don’t want my table to feel stuffy. I want our guests to feel warm, cozy and at home. I want them to linger around the table after the meal for lots of laughter and conversation. I want to create wonderful memories that will stay with me forever! 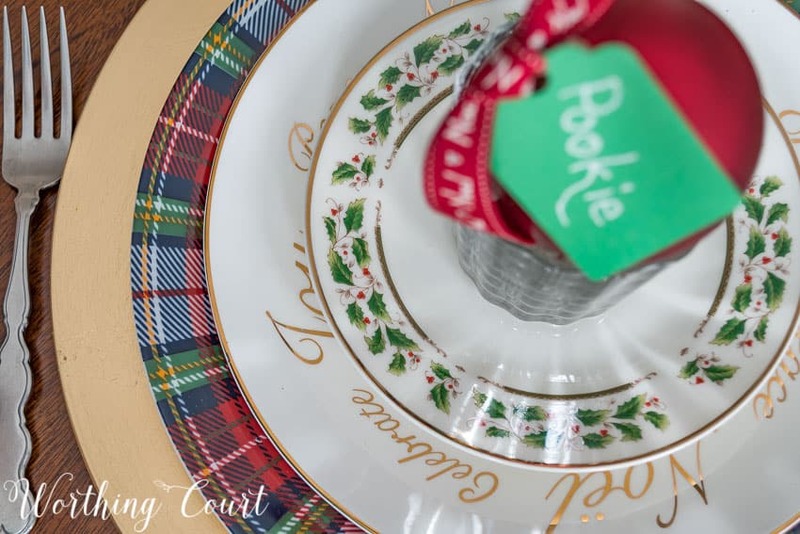 When the more formal holly dishware is combined with my tartan plaid Christmas dishes, it brings the formality of the china down and cozies the table right up! The holly dishes have a gold rim, which ties in with the gold chargers. And the tiny red berries on the holly leaves make it easy to add pops of Christmas red to the table! 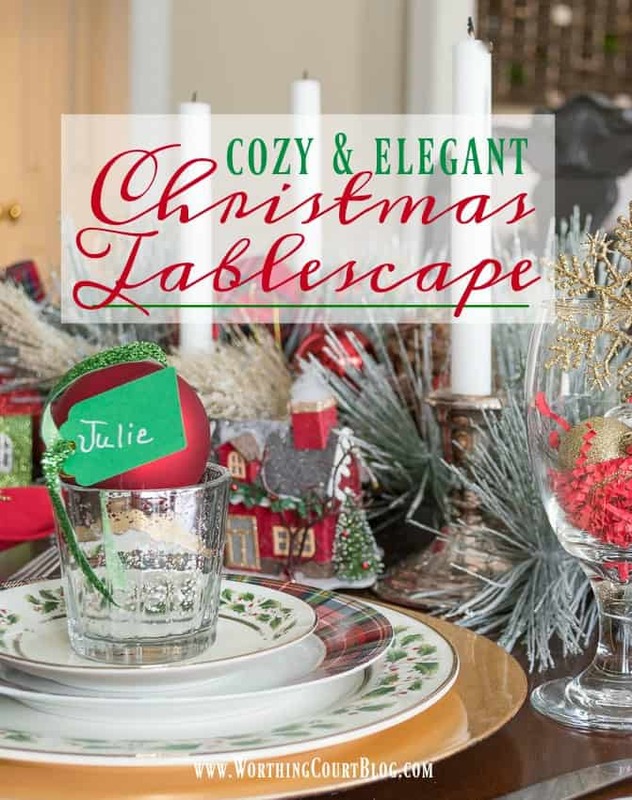 Mercury glass votive candle holders add sparkle and double as a holder for an ornament baring a name tag tied with pretty Christmas ribbon. I love how the mercury glass reflects the colors and patterns around the votive cups. And when the light hits them just right, it creates an amazing pattern. 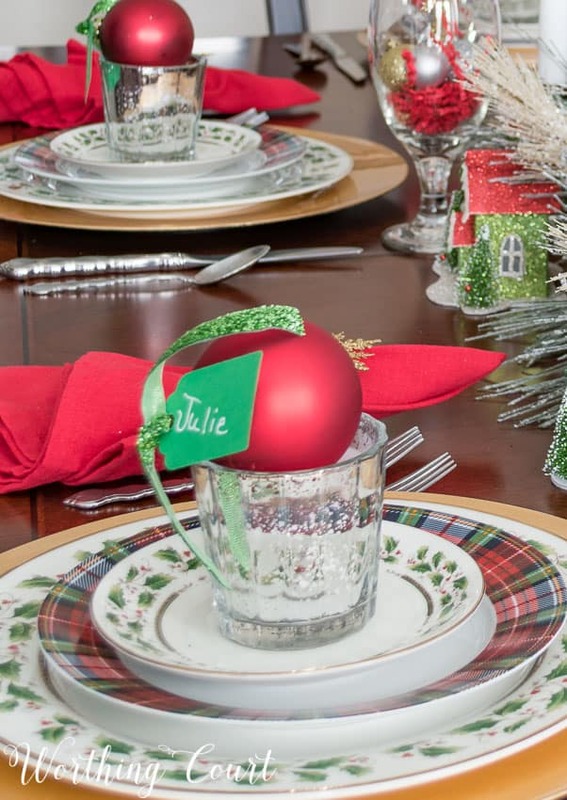 To tie the centerpiece in with the rest of the table, I tucked a few plaid and red Christmas ornaments among the pine needles of the centerpiece and borrowed a few of my cardboard glitter houses from the tree. 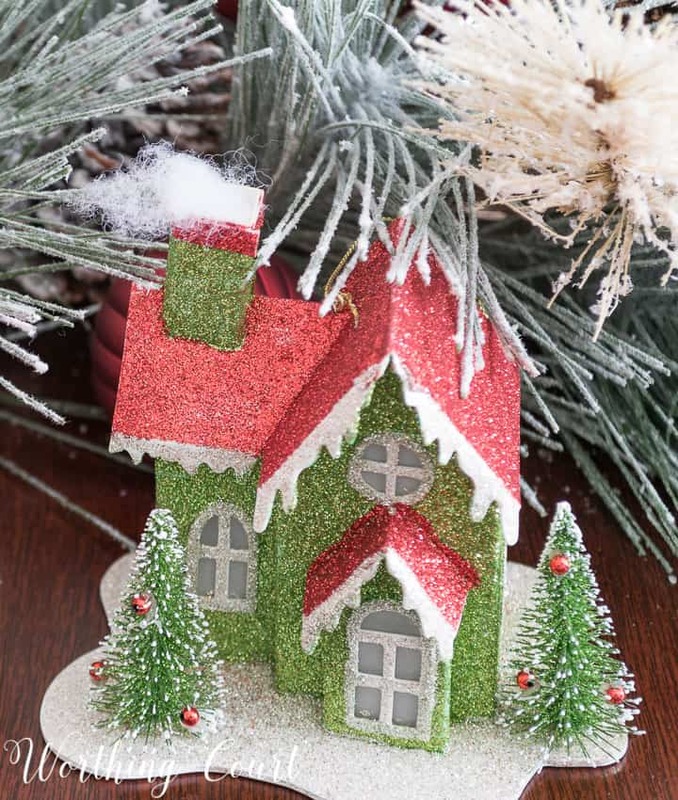 The houses are a bit rustic, but the glitter adds to the sparkle! I’m so excited to welcome my family to our special dinner table this year! Do you prepare a special meal for Christmas at your house? 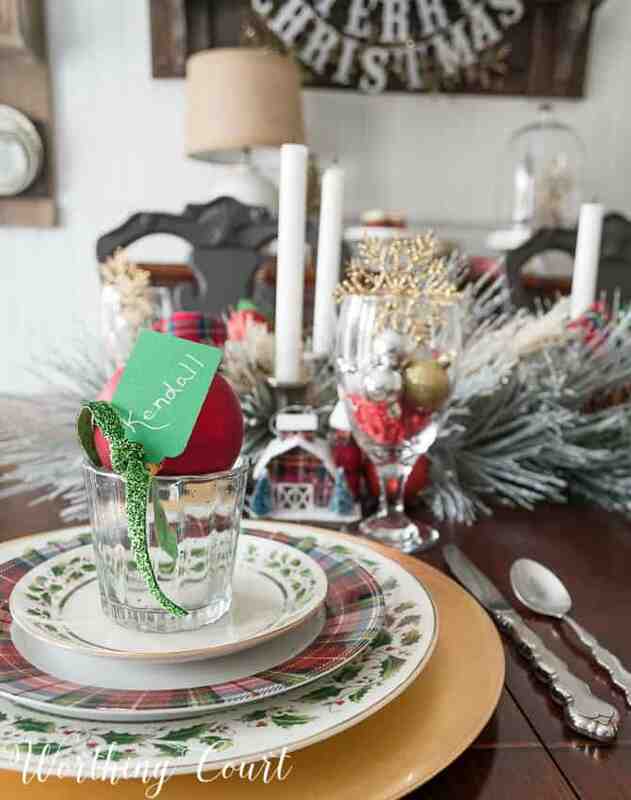 Love the plaid with the holly dishes. Very festive and cozy! What a beautiful table setting. It completes the room and is so inviting. I sure would linger with another cup of tea. Enjoy your holiday, Merry Christmas! I decided to not use my Christmas China this year for parties that have already taken place. I wanted a more casual table setting. This is a great idea. Hopefully, I can find a good bargain on coordinating dish ware. Fingers crossed! Merry Christmas! Your table is so festive. It is a good idea to mix the dishes and I need more dishes to add in with mine. It is so fun to sit around the table and share memories and I can’t wait for Christmas Day. Happy holidays to your family. 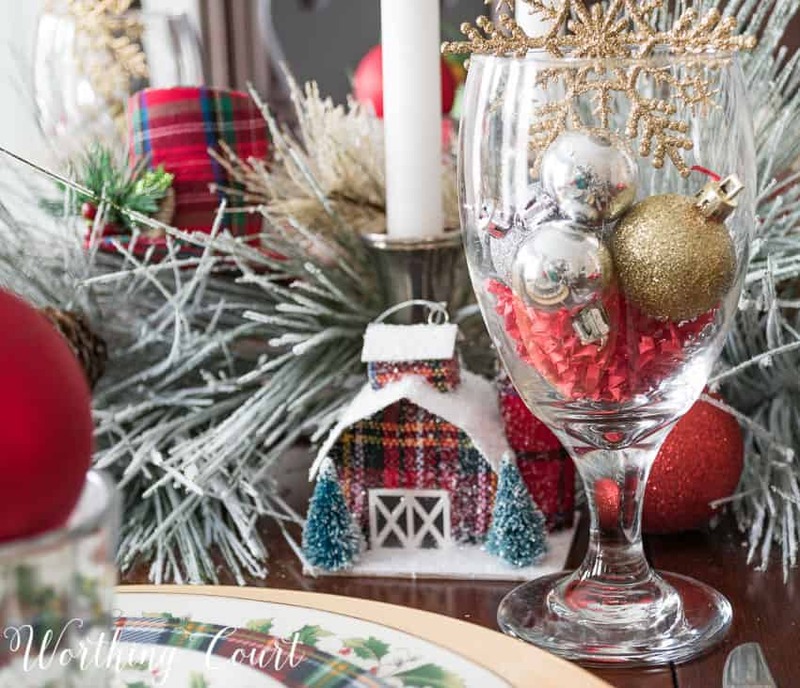 Love mixing the plaid and holly dishes! And I love that cute little plaid barn!! 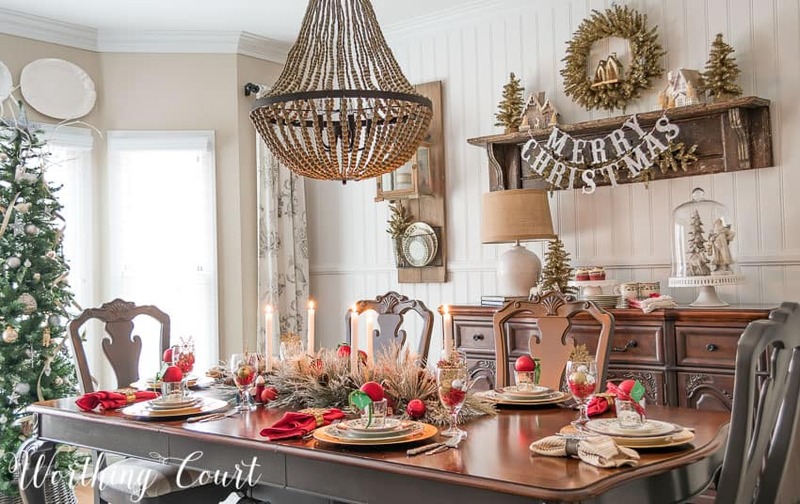 Love the house/barn ornaments on the table! Are they available somewhere this year? Hi Diane. I picked up all of the little houses last year, but I found the plaid barn ornament this year at Walgreens. Merry Christmas! Love the 2 dish patterns together! 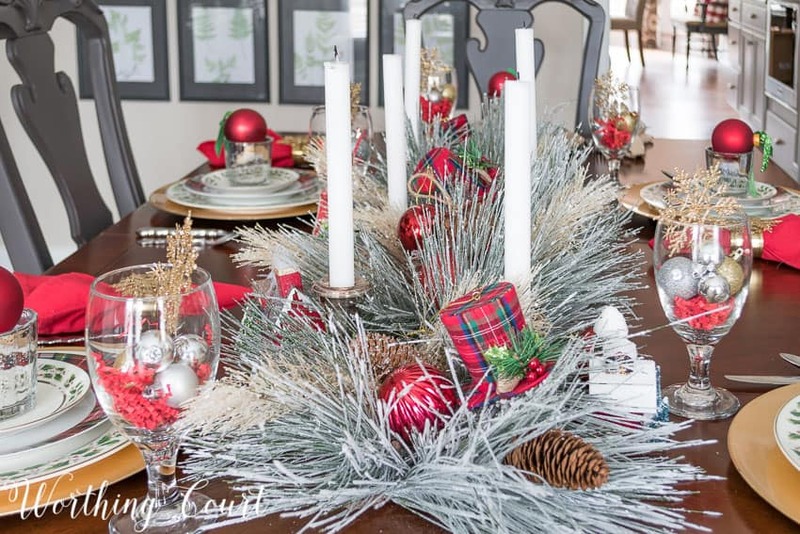 Your tablescape is terrific and I love the look of your whole dining room with it! 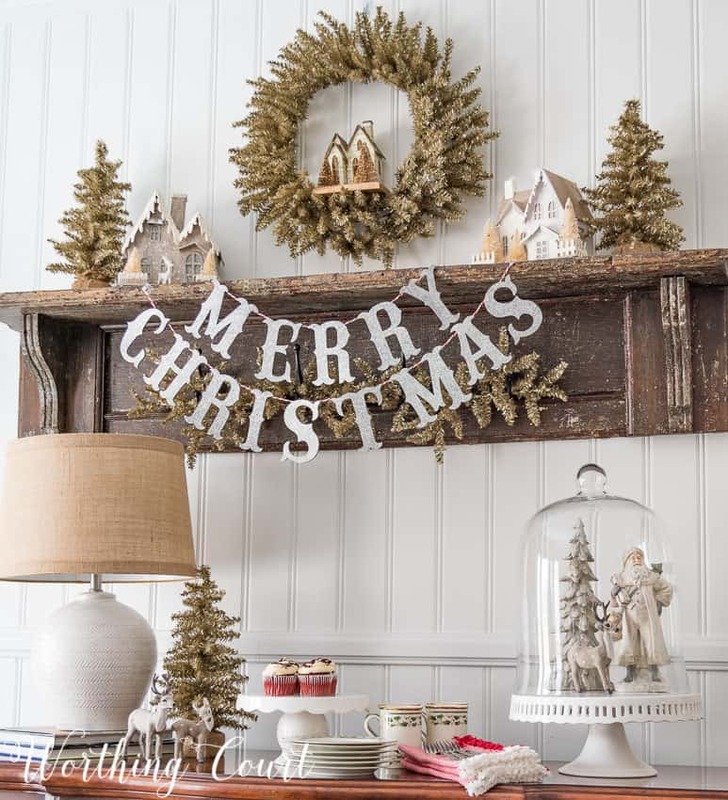 Your Christmas decor is just beautiful! Love your table and your mantle is OUTSTANDINg !! lOVE! I like everyone else really like the plaid dishes added to your Christmas dishes. I have been shopping for a tartan throw to use on our front entry bench but not successful to date. Merry Christmas.. I love your beautiful table!! Thanks for sharing!! 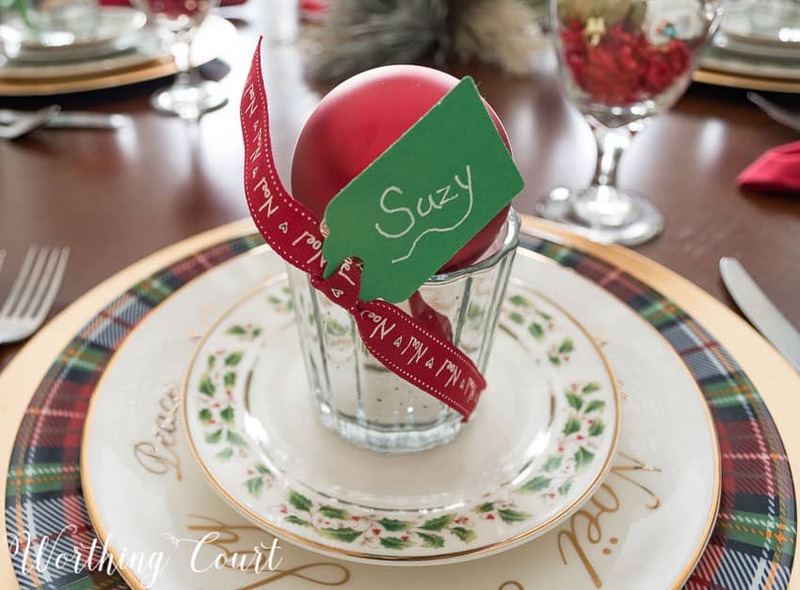 I like the idea of using ornaments as place setting/name tags. I think it would be sweet to monogram the ornaments then everyone could take theirs home when they go! Also I am loving the Merry Christmas letters. love the valance on the window. where did you get it or did you make it? Hi Joyce. I’m not sure which valance you’re referring to???? Geez I don’t know now either! Your table is so pretty. I like the way that you paired your plaid dishes with your china. I love the plaid dishes. They are most definitely on my list of after Christmas items to seek out. I have the exact same holly dishes and love the way you mixed them together. Thank you for the inspiration! Merry Christmas! What a beautiful set up! Loving the gold wreaths and foliage. So pretty. I must find some~Thank you for sharing on Merry Monday! Sharing on FB! Have a great week! Beautiful tablescape! Thanks for sharing this at the DI & DI link party. Merry Christmas! I love the dishes! So gorgeous. Thanks for sharing at Funtastic Friday. I loved your little sparkly church. What is it made of? Hi Audrey. The little church, along with the rest of the houses, are all made from cardboard. 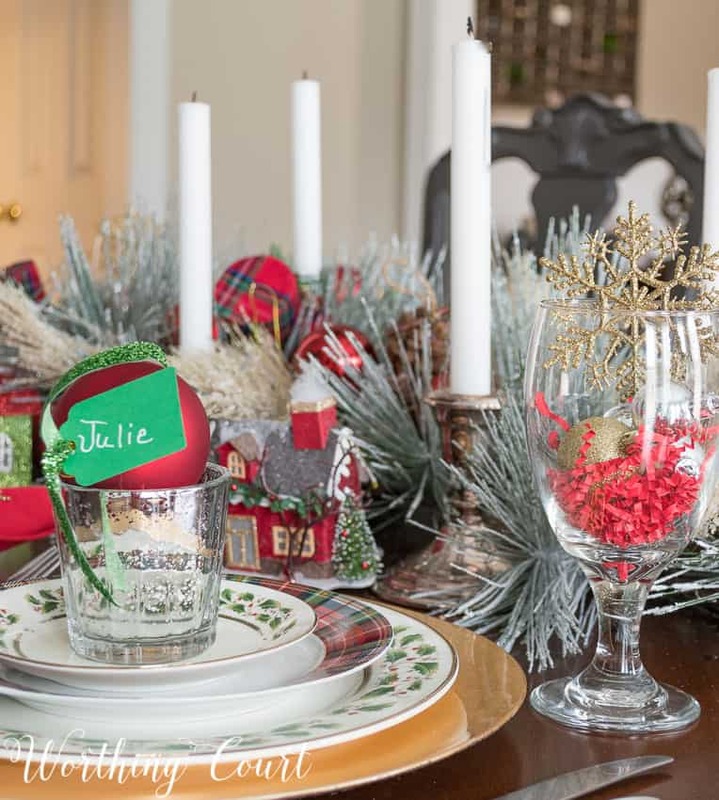 Your Christmas Dinner Tablescape is just beautiful. I especially love the Holly Christmas China as I have that pattern as well. I love that you mixed it with the plaid. You have inspired me to try that with mine. Thanks so much for sharing your awesome post with us at Full Plate Thursday! Hope you are having a wonderful week and hope to see you soon! Love how you mixed the dishes. I have the same china pattern. I read you had purchased the plaid dishes last summer, but could you tell the brand???? I want to purchase some salad plates to be used next Christmas with my china. Thank you so much. I mix plaid with my holly dishes, too. Your table is beautiful, thank you for sharing it.